Purpose: The purpose of this study was to collect information about dental hygiene program directors (PD) in order to create a comprehensive position profile for the profession and add to the current literature regarding employment trends and compensation in dental hygiene education. Information gained through this study addresses a gap in the literature and could be utilized by current and future educators considering a dental hygiene program director role or for recruitment purposes. Methods: An electronic survey, consisting of 38 items addressing areas including job characteristics, requirements, compensation, and anticipated retirement, was sent to PDs of all the Commission on Dental Accreditation (CODA) accredited dental hygiene programs in the United States (n=314). Descriptive and inferential statistics were used to analyze the data. ANOVA analyses were used to determine whether significant differences existed regarding salary and compensation, contact hours, total working hours, contract characteristics, and job expectations. Results: Directors from 122 programs responded yielding a response rate of 39%. Seventy-one percent of respondents were aged 50-59 years and 46% reported having held the program director position for 3 years or less. Thirty-five percent of participants plan to retire from their program director position in the next five years. In regards to compensation, 47% of respondents indicated making between $60,000 and $79,999 and 3% reported earning less than $40,000 while 4% indicated salaries over $100,000. Total number of teaching years and highest degree held demonstrated a positive impact on adjusted monthly salary. PDs employed in university settings were significantly more likely to have ongoing requirements for scholarly activity; those employed in settings associated with a dental school had a longer average contract length than directors in other institutions. Potential dental hygiene PDs should expect an average workweek of 40–50 hours, with the majority of the time spent on administrative duties. Additional responsibilities include teaching, scholarly activity, and committee work. Conclusion: A position profile detailing the range of employment expectations for dental hygiene PDs has been created and can serve as a guide to inform and recruit potential program directors. The American Dental Education Association (ADEA) Allied Dental Program Directors survey is conducted on a regular basis to monitor employment trends within all allied dental education; including dental hygiene, dental laboratory technician, and dental assisting faculties. Among other variables, the ADEA survey assesses percentages of time spent on different job duties, vacant positions, salary information, and demographic characteristics. Results from the 2016 survey state that during the 2015-16 academic year there were 43 retirements of dental hygiene faculty and project that by the year 2020 there will be an estimated 415 additional retirements.9 The ADEA survey also reported salary averages of $70,000-79,999 for administrators, and a contract length of 12 months for most administrative positons. While the ADEA survey addresses many of the facets of the program director position, these topics were examined broadly, utilizing descriptive statistics. Educators interested in advancing to a PD position would likely need to consider a large shift in their professional responsibilities and workload. Little information has been found in the current literature related to the position expectations and compensation for PDs. The purpose of this study was to collect information about PDs in order to create a comprehensive position profile for the profession and add to the current literature regarding employment trends and compensation in dental hygiene education. Information gained through this study addresses a gap in the literature and could be utilized by current and future educators considering a dental hygiene PD role or for recruitment purposes. A cross-sectional survey of PDs was conducted during the month of October, 2015. The author-developed survey instrument, created to address issues not included in the most recent ADEA allied dental program director survey, was considered exempt by the Pacific University Institutional Review Board (IRB). The validity and reliability of the survey instrument was pilot tested by five program directors and revisions were made based upon feedback. The final instrument consisted of 38 items addressing the following areas: position characteristics; required duties and expectations of PDs; director compensation; anticipated retirement dates of PDs as well as faculty members; and general demographics, including age and geographic region. The survey was developed using Qualtrics software (Qualtrics, Provo, UT) and administered via email. Authors manually collected names and email addresses of PDs from the American Dental Hygienists' Association website. An email invitation to participate was sent to all PDs of CODA accredited dental hygiene programs in the United States. A total of 328 invitation emails were sent, of which 14 were undeliverable, yielding 314 successfully delivered email invitations. Data were analyzed using SPSS (version 23, IBM), using descriptive and inferential statistics. ANOVA analyses were used to determine whether significant differences existed regarding salary and compensation, contact hours, total working hours, contract characteristics, and job expectations. Explanatory variables for these analyses included: highest degree held, institution type, and geographical region of the country. Linear regression analyses were used to determine if salary was influenced by number of years in the program director position and total number of years in education. Due to the variations in contract length (9-12 months), total yearly salary as well as an adjusted monthly salary (AMS), in which the yearly salary was divided by the number of months in the contract, was analyzed. Statistical significance was set at 0.05. Responses were received from 122 (n=122) PDs yielding a response rate of 39%. Comprehensive demographic information is summarized in Table I. Seventy-six percent of respondents indicated employment in a community college or technical school. The highest degree held by the majority of PDs (70%, n=78) was a master's degree. Forty-six percent of respondents have been in their current position for 3 years or less. It is also noteworthy that 60% of responding PDs have been in their positions for five years or less. In regards to number of years of experience in education, responses varied widely however 59% reported having more than 15 years of experience. Most respondents (71%) were between the ages of 50 and 69, and 94% identify as being white or Caucasian. Thirty-five percent of those surveyed (n=39) indicated that they plan to retire sometime in the next five years. 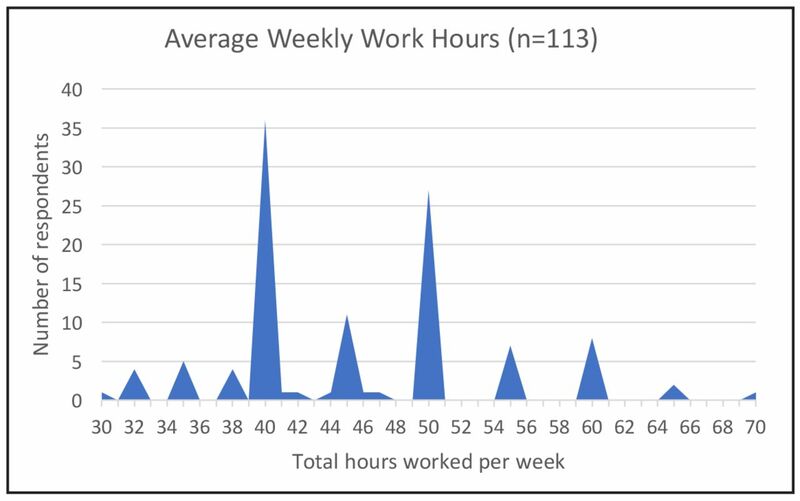 Respondents reported averaging 45.5 hours of work per week (Table II), with peaks identified at 40 and 50 hours. 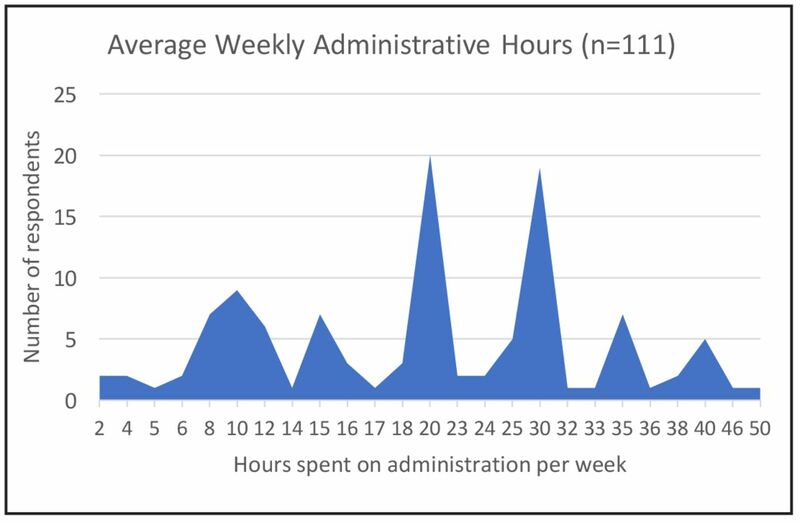 (Figure 1) The majority of the PD's time was spent on administrative duties with a mean of 21.5 hours per week (Table II), with peaks occurring at 20 and 30 hours. 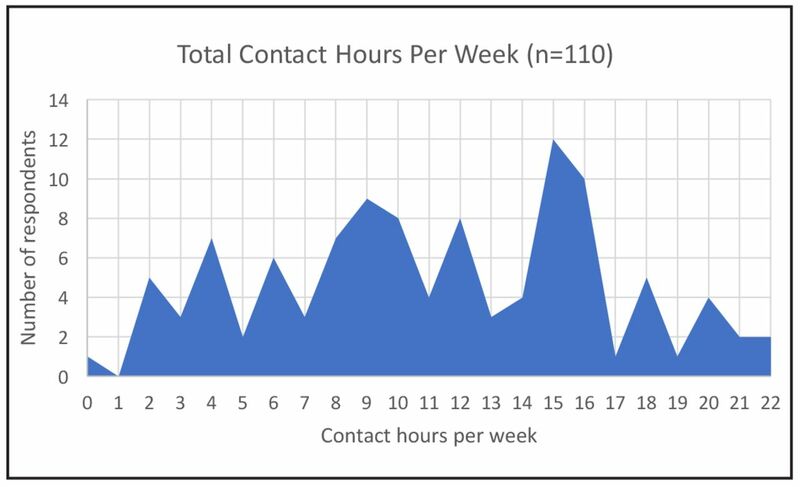 (Figure 2) Total student contact hours, or time spent with students varied greatly with the mean amount of time between 11.4 hours per week. (Table II) Peaks in the student contact hour data were identified at 8, 9, 10, and 15 hours. 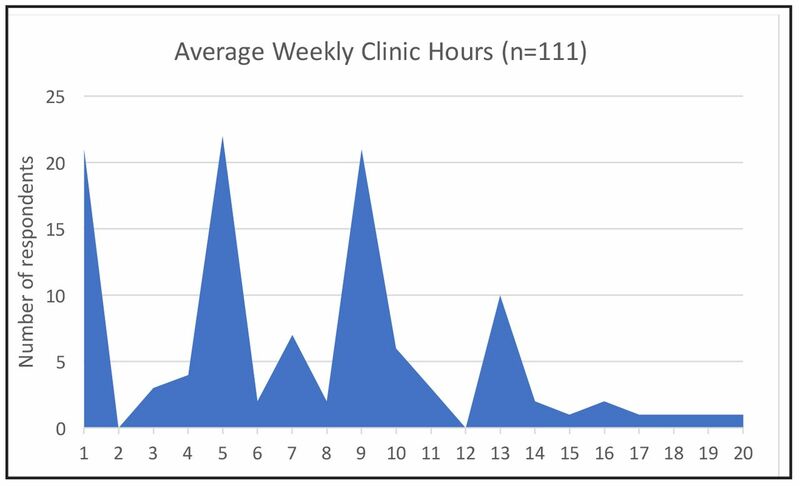 (Figure 3) In regards to the number of hours spent with students in a clinical setting, 6.2 hours were reported on the average with peaks occurring at 1, 5, and 9 hours. 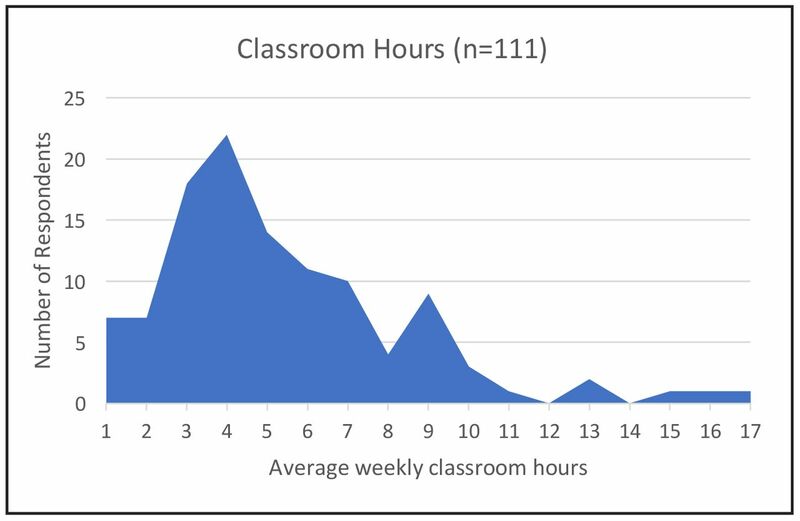 (Figure 4) Respondents reported spending an average of 4.4 hours per week teaching in the classroom, with a peak shown at 4 hours. (Figure 5) When asked about additional institutional expectations for PDs, 90% of respondents indicated committee work requirements, while only one third (32% n=37) were expected to participate in scholarly activity. A majority of program directors indicated that they were required to have a master's degree (91%). Respondents reported spending an average of 3.9 hours per week on scholarly activity. (Table II) Scholarly activity peaked at 3 hours, however there was a range from as little as 1 hour to as much as 11 hours. PDs employed in university settings were required to complete scholarly activity significantly more oftenthan those in community college settings (p<0.0001) as shown in Table III. Of the respondents (n=37) who indicated that scholarly activity was required at their institution, the types of scholarly activity included the following: continuing education (CE) course presentations or other professional presentations (92%); original research publications in peer-reviewed journals (70%); research poster presentations (70%); textbook chapter writing (65%); published literature reviews in peer reviewed journals (59%);other published work (35%); mentoring graduate students (11%); and grant writing (8%) shown in Table II. There were no statistically significant findings when evaluating the relationship between institution type and differences between student contact hours, clinical hours, administration, and total working hours. Adjusted monthly incomes varied substantially, with with the respondents receiving a mean monthly salary of $6,726 with a standard deviation of $1,530. ANOVA analysis determined no statistical statistically significant differences regarding monthly salaries as compared by geographical region. (Table VI) The total number of teaching years had a positive impact on adjusted monthly salaries (p=0.001) with survey respondents receiving an additional $75.47 per month for each year of experience. When examining the total contract salary, PDs earned $493.14 more per year for each year of teaching experience (p=0.017). Table VII shows that PDs holding a doctorate degree earned higher salaries than PDs with a master's degree or those progressing toward a doctorate degree (p=0.001). Adjusted monthly salary and total salary compensation for PDs when compared to the number of years in their current position and institution type was not significantly different. Results from this study support the existing literature regarding the potential shortage of dental hygiene educators and more specifically PDs due to retirement as evidenced by the findings that 46% of PDs surveyed have held their position for three years or less and 35% anticipate retiring in the next 5 years. The recent ADEA survey does separate projected retirement rates between PDs and faculty members.9 A high number of new PDs with fewer than three years in their current position, may be indicative of an increased PD turnover rate in recent years. These findings concur with previous research concluding that increasing numbers of PDs have either retired or otherwise vacated their positions, and that there are many new PDs in dental hygiene education settings.1 The majority of the respondents in this study indicated a requirement of a master's degree to hold the position of program director which is consistent with CODA standards.14 Considering that approximately one third of the dental hygiene education workforce currently only holds a bachelor's degree as their highest credential,9 these individuals will not be qualified to assume the PD positions that are predicted to be vacant in the next five years. Transitioning from a full-time faculty position to a program director positon should ideally entail a shift of duties rather than a significant increase in total working hours. With an average 11.4 total contact hours per week, program directors continue to have a great deal of direct contact with students. Time spent on scholarly activity varied significantly with a higher number of PDs in university settings still required to engage in scholarly activity in addition to their administrative duties however continuing education and professional presentations were the most frequently selected options over submissions to peer-reviewed publications. This trend may be indicative of a movement from the more traditional view of scholarship to an environment that embraces Boyer's model of discovery.23 Faculty scholarship as described by Boyer includes the discovery of new knowledge, integration of knowledge across disciplines, application of knowledge in addressing problems in society and the professions, and the development of teaching models, practices and approaches to achieve optimal learning.23 While there appears to be more flexibility in the range of acceptable scholarly activity, future PDs should expect more requirements in this area when pursuing positions in university settings. 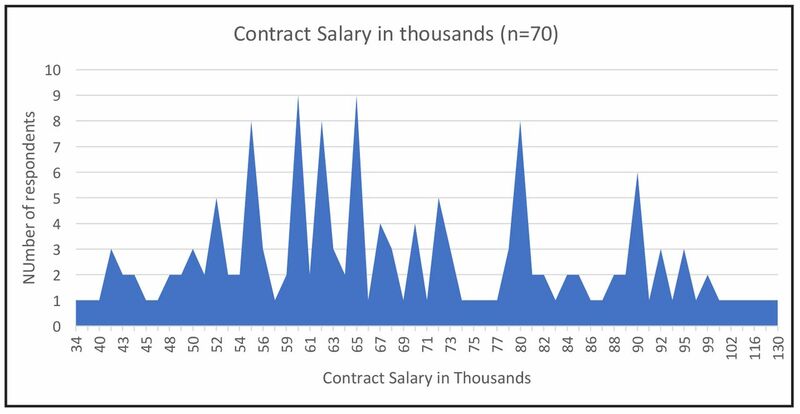 With respect to compensation, the more detailed results from this survey were consistent with average salaries of PDs as reported by the most recent ADEA survey.9 A PD can expect to earn between $60,000 and $79,000 per contract salary depending on experience and the educational institution, with contracts ranging from 9-12 months. No significant differences in salaries were identified between different types of educational institutions or geographic regions of the country in spite of the assumption that with regional variations in the cost of living across the U.S. would influence compensation. However, there was a significant correlation between salary and number of years of educational experience and higher educational credentials. Based on this information, it may be assumed that a PD applicant with experience as an educator and a doctoral degree would command a higher salary regardless of the geographic location of the educational institution. Employer provided benefit packages, an area not previously studied, demonstrated that the majority of the respondents were provided medical and dental insurance as well as life or disability insurance. In addition, most employers contributed to a retirement account on the employee's behalf and provided some level of an allowance for travel to professional conferences. However, it is worth noting that the travel allowances were relatively low and cover limited travel opportunities to professional conferences regardless of their location. Attending professional conferences is a particularly important aspect of being PD with benefits ranging from networking with other leaders in the profession to increasing the visibility and reputation of the dental hygiene program. Limitations of this study include its sample size of 122 respondents as compared to the 2016 ADEA Allied Dental Program Directors survey. However, the limited generalizability of the results due to a smaller sample size can be mitigated by the additional detail collected on PD duties. 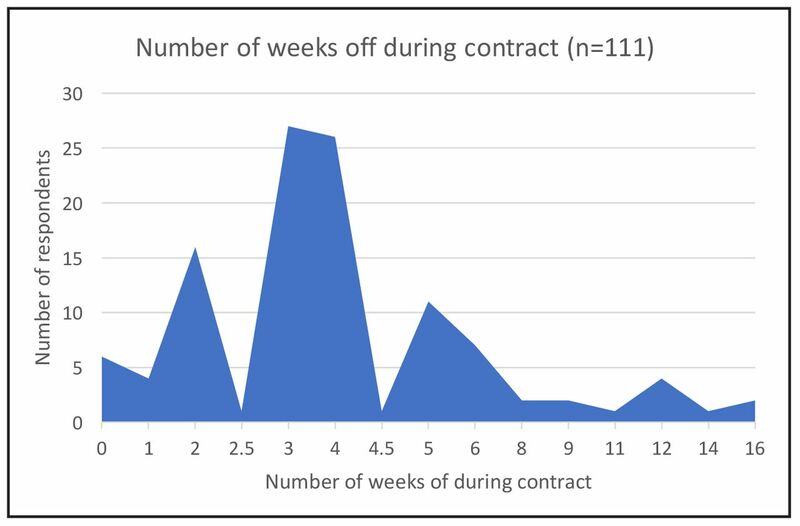 Additionally, there were two questions with significant outliers in the survey results; the number of weeks off during contract period; and the employer contribution to retirement. These outliers may be due to misinterpretation of the question. Figures have been provided to visually represent all of the responses allowing for visualization of the data peaks. A position profile detailing the range of employment expectations for dental hygiene program directors has been created and can serve as a detailed guide to inform and recruit potential program directors. Strategies to recruit qualified individuals into the program director position should be explored to ensure dental hygiene education continues to have highly qualified leaders. The authors would like to thank Matthew Hunsinger for his assistance and statistical expertise. Cori M. Pacanins, RDH, BSDH and Katelyn J. Thomson, RDH, BSDH are 2017 graduates of the Pacific University School of Dental Hygiene Studies, Hillsboro, OR. Amy E. Coplen is an associate professor; Kathryn P. Bell is an associate professor; both in the School of Dental Hygiene Studies at Pacific University, Hillsboro, OR. This manuscript supports the NDHRA priority area Professional development: Education (evaluation). This project was funded by a Faculty Development Grant awarded by Pacific University.
. Status of current dental hygiene faculty and perceptions of important qualifications for future faculty. J Dent Hyg. 2011 Winter;85(1):57-66.
. Trends in allied dental education: an analysis of the past and a look to the future. J Dent Educ. 2001 May;65(11):1304.
. Mentoring of dental and dental hygiene faculty: a case study. J Dent Educ. 2011 Mar;75(3):291-9.
. The Need for New Qualified Dental Hygiene Educators. Access. 2010 Sept-Oct;24(8):4-5.
. The current status of allied dental faculty: a survey report. J Dent Educ. 2004 Mar;68(3):329-44.
. Faculty openings and recruitment in dental hygiene education. J Dent Hyg. 1992 Jul-Aug 66(6):254-8.
. The dental hygiene faculty shortage: causes, solutions and recruitment tactics. J Dent Hyg. 2010 Fall;84(4):165-9.
. Institutional responsibilities and workload of faculty in baccalaureate dental hygiene programs. J Dent Educ. 2007; Nov;71(11):1403-13.
. Faculty retention in dental hygiene programs. J Dent Educ. 1982 Sept;46(9):533-6.
. Dental hygienists' perceptions of barriers to graduate education. J Dent Educ. 2011 Aug;75(8):1030-7.
. A survey of dental hygiene program directors: summary findings and conclusions. J Dent Educ. 2010 Jan;74(1):79-87.
. Mentoring future dental educators through an apprentice teaching experience. J Dent Educ. 2002 Jun;66(6):703-9.
. Accreditation standards for dental hygiene programs [Internet]. Chicago (IL): Commission on Dental Accredidation; 2017 [cited 2017 Feb 27]. Available from: http://www.ada.org/~/media/CODA/Files/dh.pdf?la=en.
. Career satisfaction and job characteristics of dental hygiene master's degree graduates. J Dent Hyg. 2000 Summer;74(3):219-29.
. Growth of the dental hygiene profession. J Dent Hyg. 2012 Winter; 86(1):6.
. Chicago: American Dental Hygienists Association: c 2012-17. Dental hygiene programs; 2017 [cited 2017 Feb 22]; [about 2 screens]. Available from:http://www.adha.org/dental-hygiene-programs.
. Advancing our profession: are higher educational standards the answer? J Dent Hyg. 2012 Summer;86(3):168-178.
. Characteristics of full-time faculty in baccalaureate dental hygiene programs and their perceptions of the academic work environment. J Dent Educ. 2007 Nov;71(11):1385-402.
. Stress, burnout, and renewal activities in dental hygiene education administrators: leadership implications. J Dent Educ. 2010 Mar;74(3):235-50.
. Scholarship reconsidered:priorities of the professorate. New York:Carnegie Foundation for the Advancement of Teaching with Jossey-Bass; 1990. 147p.
. Analysis of dental hygiene prgrams directors salary and workload. Poster session presented at: American Dental Education Association Annual Session. 2016 Mar 12-15;Denver, CO.
. Full-time dental faculty perceptions of satisfaction with the academic work environment. J Dent Educ. 2009 Oct;73(10):1153-70.